RV or Hotel? Let's take a Look! TO RENT AN RV OR STAY IN A HOTEL? RV or hotel? 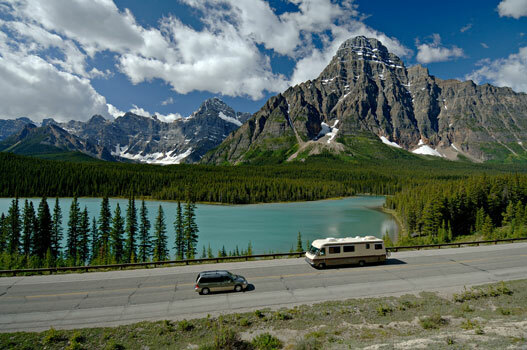 Travel throughout Western Canada, with its great distances, remote heritage sites, and picturesque scenery, tends to accommodate recreational vehicles. Hotels and lodges, often located in some of the most scenic areas, can offer you all the comforts of home. Let’s first explore the two means of travel. 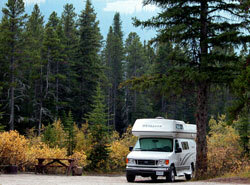 Using a car often does not afford the view that traveling in an RV (recreational vehicle) does. When seated in an RV, one generally sits more upright and higher, thus allowing one to observe the adjacentpanorama with greater ease. The automobile on theother hand is designed to move people from point A topoint B in the quickest and most efficient way. Hardly the best way to enjoy all that Western Canadahas to offer. 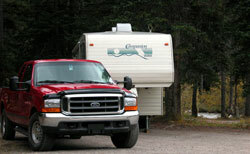 Do not be intimidated by the size ofsome RVs, they handle as well as larger cars. Acceleration and traveling speed are reduced in an RV, however on a sightseeing holiday, speed is not necessarily a high priority. A short stop at a viewpoint can be enhanced with a cup of your favorite Java, freshly brewed in your RV. While the view is the same, your car does little but transport you to that destination. After spending the day traveling, it is now time to stop and enjoy your particular location. The lodge or hotel you have booked awaits you. When choosing a hotel, try to pick one not in a commercial zone, which could alter the holiday experience. Inside the luxurious accommodations your four walls await. This is great for those who wish to watch the evening news and the latest episode of their favorite program. Traveling in an RV, your campground reservation awaits and you can park under the stars shielded from the glare of the full moon by the lodgepole pinetree next to your site. If you are so inclined, you may then prepare your prime Alberta Beef steak on the open fire next to your bed on wheels. Sleeping in the same bed each night with bedding of your choice in some cases. Having your personal bathroom with you, at all times. The ability to stop and rest at your convenience. Your favorite foods travel with you. The ability to travel without a daily schedule – campgrounds, if full, have overflow areas, which lack full services, but generally one night under those conditions is acceptable. The ability to travel with extended family members in a more spacious area in full safety. The ability to meet and exchange ideas with travelers from around the world. 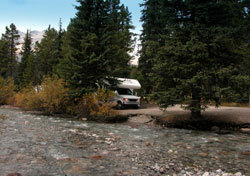 The greatest disadvantage in traveling with an RV is the fact that you are responsible for yourself. You have more responsibility in the maintenance of your RV. If you have the ability to take this on, the result of your efforts are well worth it. Do not be intimidated by maintenance issues. All rental dealers provide instructional time with regard to those matters. To some, the greatest advantage, as mentioned above, is the ability to meet with your fellow travelers. The RV community is generally very friendly and helpful. Any problem you have soon becomes the entire campground’s problem. However, this occurs only at your request. The evening campfires attract your fellow travelers and soon the topic of the most scenic lookout or the location of the large herd of elk are the subject of conversation. On occasion, friendships made at the fireside turn into long-term friendships. Recreational vehicles may not be for everyone, however they add the personal feeling of living with nature. When it comes down to it, the decision of RV or hotel is really based on what type of holiday you really want. How much of a "back to nature" experience do you want or are you prepared for? The rewards are clear - but everyone must decide in the planning stages what will ultimately make your vacation unforgettable!